Generally it has always been witnessed that there is a jealous feeling between two most successful people of the same level. But here the case seems very different. On Wednesday night, the legendary actor Amitabh Bachchan attended the premiere of Sachin’s biopic with son Abhishek Bachchan and Aishwarya Rai Bachchan. And as he walked out watching the much-anticipated film of the year, he was all praises for master blaster who plays himself in the biopic. The actor was not only blown over the story of the film but was also impressed with the message embedded in it. 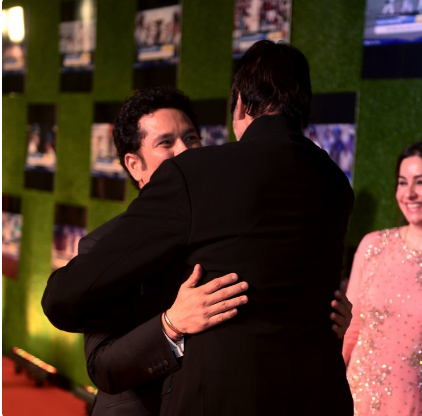 Telling us about the film, Amitabh ji said, “It’s a very emotional feeling, apart from the life history of Sachin, I believe it’s a fantastic film for the pride of India. I was telling Sachin, this film should be shown to every individual in the country, it should be shown in every school, not just because we are so proud of Sachin, but how proud he has made the country. I am so glad this movie was made. We all know about the life of Sachin but what the film has done, it has shown the rest of the world, how somebody from very humble beginnings can put up a fight and make this country so proud. I feel just so happy.” He even said that, he is lucky to be born in a country where legends like Sachin Tendulkar live. 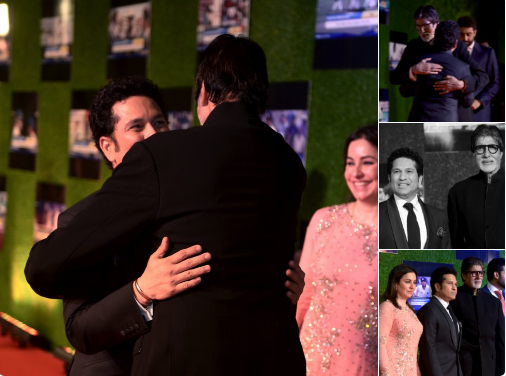 Amitabh Bachchan is know for being very active on social media and he proved that when he posted a picture of Sachin and his wife at the premiere on his Twitter account. He also stated that last night he was filled with pride and emotions and मैं उस देश का वासी हूँ जिस देश में Sachin बहता है !!! Having a look at the venue of the event, we can say that the place had the aura of Sachin all around with the LCD’s playing his special on-field moments in the theatre. Not only this, on the invitations which were sent out to people had a mini bat with Sachin’s autograph engraved on it. The invitation itself gave goosebumps to people and gave a distinct cricket feel to the event. Not only him, but many actors like Ranveer Singh, Anushka Sharma, Virender Sehwag, Kriti Sanon and many more have showed their excitement on Sachin’s debut in the film industry.